It would be of interest to know what Armenian, Indian, Chinese, Korean and Japanese musicians make of the music of the late Alan Hovhaness. We think of much of it as Oriental and mystic and this is true enough by our Western terms of reference. I even perceive the sound of much of Hovhaness to be more 'authentic' than Rimsky-Korsakov or Ketèlbey or Bantock. There is nothing to snigger at in Hovhaness. The music communicates as the expression of a sincerely driven artist. This collection is attractively presented in a design that emphasises a Far Eastern mystique that watermarks its way through each piece. The Suite [7.30] comprises a Doloroso which is not all that sad - full of glutinous oriental rippling, an Invocation Jhala: percussive and with the oriental sway of the Muezzin's call and a Processional half icy half in Arabian Nights warm sable. The First Pastorale explores a rippling darkness and involves the pianist in reaching inside the piano and pluck the vibrant intimate entrails of the instrument. Over this a shadow of a melodic fragment half Nights in the Gardens of Spain and half Rachmaninov shakes the deep and humming gloom. From it emerges a Bachian gem of crystal icy beauty. The Two Ghazals are from Hovhaness's ultima thule the first being an Hispanic treacly nocturne and the second a dissonant essay in necromancy built from an ostinato. 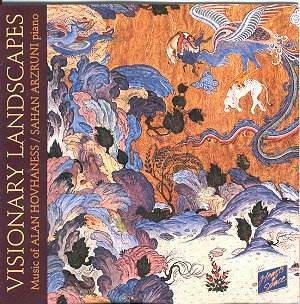 There is a touch of Sibelius, Sorabji (without his luxuriant complexity) and Rubbra (the oriental chamber works) in this. Much the same can be said of the Hymn which suggests links with Neptune; a stepping off from the corporeal into the ethereal. Achtamar with its feline aleatorics selecting the tones of the drumbeat stutter. Hovhaness has a gift for tapping into childlike states of mind and this is apparent in the Child in the Garden as it is in Moondance. The Twelve Armenian Folk Songs (perhaps inspired by his revered Komitas Vartabed - priest and composer) dart back and over a varied landscape: Bach, Hungary, Handel, evocations of exotic instruments like the Zurna as used in Avet Terteryan's impressive Third Symphony, dainty crystal-shepherd studies, peasant songs, flickering desert fires and overgrown ruins like those that graced the Poseidon LP sleeves. Finally we come to the work that gave this album its title: the 1965 Visionary Landscape. Repeated notes are played fever-fast over which a curious melody undulates. There is the urgent rapidity of an evening bell and a fragile crystalline quality. Hovhaness (and Arzruni) conjure wonders of sound from this single obdurate percussive instrument and weaves a richly allusive web silence and the sounds in between. This is not music for those in a hurry. Or perhaps it is just what we need. Timeless haikai for the rushed and impetuous. The downsides to this disc are its parsimonious allocation of playing time and the fact that Hearts of Sound do not band separate movements. Excellent notes. Design values are of the highest.